This made me smile: Internal polling from the Libertarian ticket in the last election — Gary Johnson and William Weld — show that the campaign prevented Donald Trump from winning the popular vote. 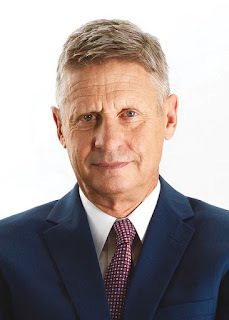 (The polling showed that 75 percent of the Johnson-Weld votes came from people who otherwise would have voted for Trump). "Governor Weld said that Johnson-Weld internal polling showed that 75 percent of their voters would have voted for Donald Trump had they not been in the race. The Libertarian ticket received nearly 4.5 million total votes in the election. It makes logical sense that three fourths of these voters, drawn to a ticket of former, successful two-term Republican Governors, would be more attracted to limited government advocates promising change from the last eight years. In addition, they saw absolutely no appetite amongst their limited government voters to support the Clinton-Kaine ticket." Via Jake Shannon at Discordian Libertarians on Facebook.